Birdhouses make a nice addition to any yard. Making one of your own and then getting to witness it being used is a satisfying and gratifying experience the whole family will enjoy. Different types of birds require different designs in birdhouse styles. Wren birdhouses are simple in design and quite effective. Measure and cut the exterior grade plywood in the following sections; one 11 inches long (back), three 8 inches long (front and two sides), one 8 1/4 inches long (roof), and one 4 inches long (floor). This will leave you with six sections of the wren house. Discard the leftover wood. Take two of the three 8-inch sections and make a 10-degree angle cut at the top of each one. Drill a 1/4 inch hole 1/2 inch down from the top of the back of the house in the center. Use the measuring tape and a pencil to measure and mark as close to the middle as possible. This is the hole to hang the birdhouse. Drill four 1/4 inch holes through the width of the floor near each corner. These are vent holes and do not need to be exact. Attach the floor to the back 1 inch from the bottom of the back. Use nails or screws to attach the floor and fasten the floor through the exterior side of the back. Use the level, square, and a pencil to mark a precise measurement to attach the floor to the back. Attach each side to the floor so the bottom of each side is even with the bottom of the floor. Make sure each 10-degree angle is sloping toward the front of the house. Align the last 8-inch cut wood (the front) to the top of the 10-degree angle cut and mark off the excess of the bottom so the front is even with the bottom of the floor. Cut the excess off with the saw and discard. Attach the front to the sides. Measure 5 1/2 inches from the bottom of the front of the house and in the middle of the front and make a mark. Drill a 1 1/8 inch hole through the front of the house and then remove the shavings from inside the house. Place the roof on top of the house and affix it to the back of the house with the exterior hinge and supplied hardware. Make sure it's even on both side and will overlap the front of the house about 1 inch. Screw one eyelet into the side of the front of the house near the roof. Screw another one into the side of the roof above it. Repeat this step for the other side. Zip tie the eyelets together and cut off the excess zip tie. This will allow you to open and clean the house out each season between nesting periods and you'll just have to replace the zip ties. Locate a spot 6 to 10 feet high and hang the bird house. Use a screw-in hook to hang the house to a tree or an outbuilding or another location you desire. Do not place a perch below the entrance hole in the front of the house. Perches on wren houses invite larger birds to land and take over the nest. 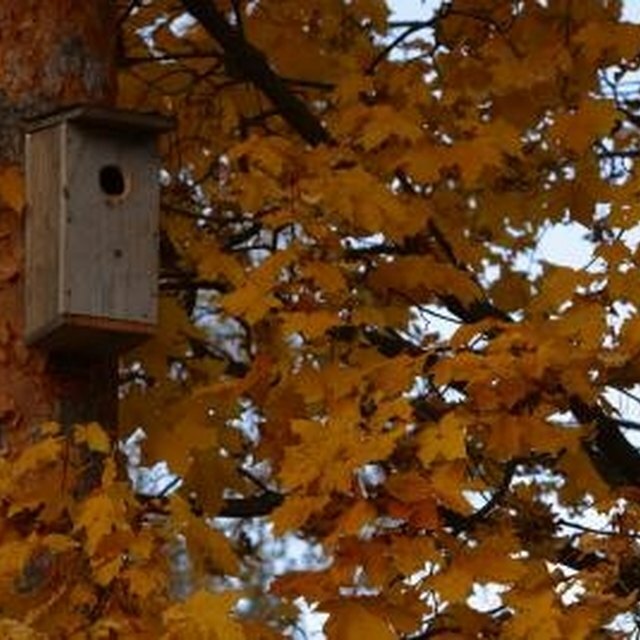 Place the bird houses near trees or large bushes.